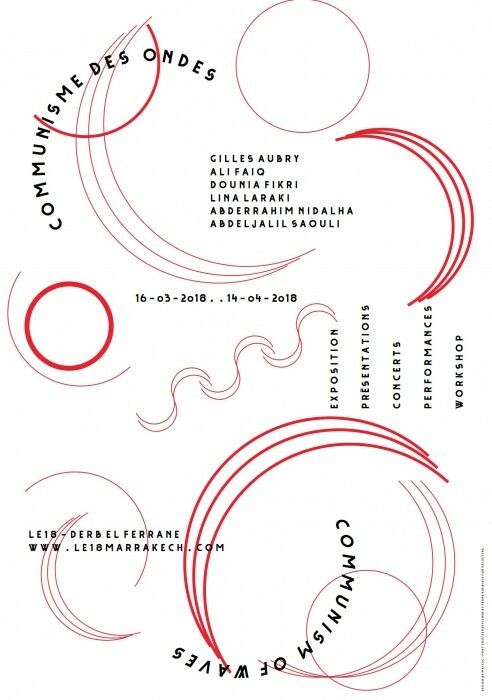 A project by Gilles Aubry, in collaboration with Ali Faiq, Dounia Fikri, Lina Laraki, Abderrahim Nidalha, Abdeljalil Saouli. Starting from Gilles Aubry’s researches on sound and listening, Communism of Waves is an artistic project that explores our environment’s sonic and vibrational dimensions — from animal, vegetal and mineral voices, to ritual and musical practices, in addition to technological and spiritual waves. Developed by LE 18 in collaboration with artists Ali Faiq, Dounia Fikri, Lina Laraki, Abderrahim Nidhala and Abdeljalil Saouli, the project comes to life through an exhibition and a public programme. The exhibition presents four art installations focusing on specific forms of interaction between humans and environmental voices, exploring new territories of post-natural speculation. Meanwhile, the public programme extends the transdisciplinary approach of the exhibition with presentations by guest speakers from various fields (ethnology, paleontology, performance and music). They will share their knowledge and practices with the audience, proposing new perspectives on shared listening, history and belonging. Taking radio as a model for investigating new forms of wireless and interspecies communication, Communism of Waves comes as an attempt to challenge the creeds of modernity and rethink the relationships between nature, culture and technology. Most importantly, it stresses the need to re-imagine our sense of collectivity. Agadir earthquake from a local ontological perspective, combining historical, visual, seismic and musical data into a geo-fictional installation. Dounia Fikri’s photographic documentation of wild rave parties complement this ensemble, where bodies merge through sound with technology and the environment.